Legal experts said this cannot be seen as an attempt to cartelise the industry, because the TV networks have submitted a la carte rates. 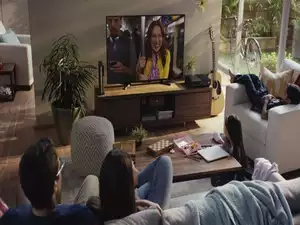 MUMBAI: Top television broadcast networks, including Star, Zee and Sony Pictures, have decided not to offer their channels in the basic pack of cable and DTH operators, once the new tariff order for the industry comes into effect, multiple highly placed people have confirmed to ET. This will be a shock for viewers who were expecting a significant drop in monthly cable or DTH bill, as many of their favourite channels will not be available in the basic pack capped at Rs 130 (plus taxes) by the Telecom Regulatory Authority of India (Trai) in its tariff order. Zee Entertainment Enterprises (ZEE), Sony Pictures Networks India (SPN), Viacom18 and TV18 are among networks that have converted all their free-to-air channels into pay channels. “All of us decided not to offer our channels in the basic pack for two reasons,” an industry executive said. “First is that there will be a mad rush to be a part of these packages and distribution platforms (cable & DTH) will ask for astronomical carriage and placement fee, and secondly, viewers will not want to go for higher packs if they can get their dose of entertainment at a low price,” the person told ET on condition of anonymity. “Offering of channels in the base pack or any particular package, is to be done by the delivery platform operator (DPO). The broadcasters are only mandated/required to declare the MRP of their channels and the channels must be offered on an a la carte basis. These prices are competitive and definitely not likely to be the same,” said Abhishek Malhotra, partner at law firm Bharucha & Partners. “If the broadcasters’ channels do not figure in the base pack offered to the consumer by the DPO, the broadcasters cannot be held liable for price fixations, and definitely not for cartelisation,” he said. Trai had implemented the tariff order and interconnection regulations in early July after the Madras High Court upheld them. Star India has challenged the Madras High Court order in the Supreme Court, and the apex court is hearing on the matter. Except for Star India, most broadcasters have complied with the tariff order by announcing their respective reference interconnect offer (RIO) documents, listing the maximum retail price of channels and bouquet rates. As per their RIO documents, ZEE, SPN, Viacom18 and TV18 have converted all their free-to-air channels into pay channels. A top executive at a broadcasting company said the idea was to make the basic pack “unattractive” for subscribers. “For long the pay TV industry has suffered low ARPU (average revenue per user) and we decided not to continue with the same mistake we committed with FreeDish,” the person told ET. “With none of the channels of the top broadcasters available, they (subscribers) will be forced to opt for pay channels at higher price.” At given RIOs, a subscriber will have to shell out Rs 400-450 per month for all the standard definition (SD) channels of top broadcasters. “We are pricing our driver channels in different genres at or close to Rs 19 as we want to offer a la carte and bouquet options,” a SPN spokesperson said. “It’s a response to the tariff. Can’t comment on what other broadcasters are doing.” Trai has capped a channel’s price in a bouquet atRs 19 per month. ZEE and Viacom18 did not revert to ET queries as of press time on Tuesday. If the Supreme Court order is in favour of Trai, broadcasters will have to sign their interconnect agreements with cable and DTH companies by December 27 and comply with the new tariff order, which offers consumers choice to get first 100 channels for not more than Rs 130. “Out of these 100 channels, 26 are mandatory Prasar Bharati channels and we expect a rush among broadcasters to pay to get in the remaining 74 channel slots,” said a senior executive at a national cable company.